DAVE ROBERTSON IS no longer in charge at Sligo Rovers. The SSE Airtricity League Premier Division club confirmed this afternoon that they have parted company with the 43-year-old Englishman, who spent 18 months at the helm at the Showgrounds. Assistant manager Declan McIntyre will take temporary charge of first-team affairs while the club begins the search for a permanent replacement for Robertson, who took over for the 2016 season following a spell managing Peterborough United. Robertson guided Sligo to a fifth place finish last season but the Bit O’Red have struggled so far in 2017. They’re currently second from bottom in the Premier Division, having won just one of their seven games. Robertson’s final game in charge was Monday night’s Connacht derby away to Galway United, when Sligo came from behind to draw 1-1 thanks to an equaliser from Kieran Sadlier. “Everyone at Sligo Rovers would like to thank Dave for all of his hard work, dedication and commitment during his time as our manager,” said Sligo Rovers chairman Martin Heraghty. “He took over after a difficult season in 2015 and led us to a very creditable fifth place finish last year and qualified for the IRN-BRU Scottish [Challenge] Cup in the process. 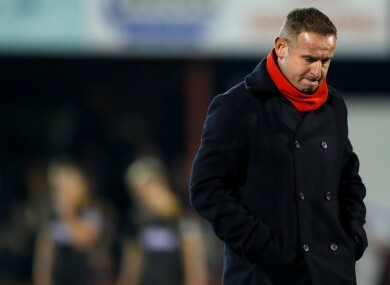 Robertson is the second manager to depart the League of Ireland this week, after Martin Russell’s time in charge at Limerick came to an end on Monday. Email “Dave Robertson is the second League of Ireland managerial casualty this week”. Feedback on “Dave Robertson is the second League of Ireland managerial casualty this week”.